This months color for the Rainbow Scrap Challenge http://superscrappy.blogspot.com/p/rsc-17.html is neutral! Neutral won't work in my long term RSC quilt project so I decided just to play with scraps and see what happens this month. 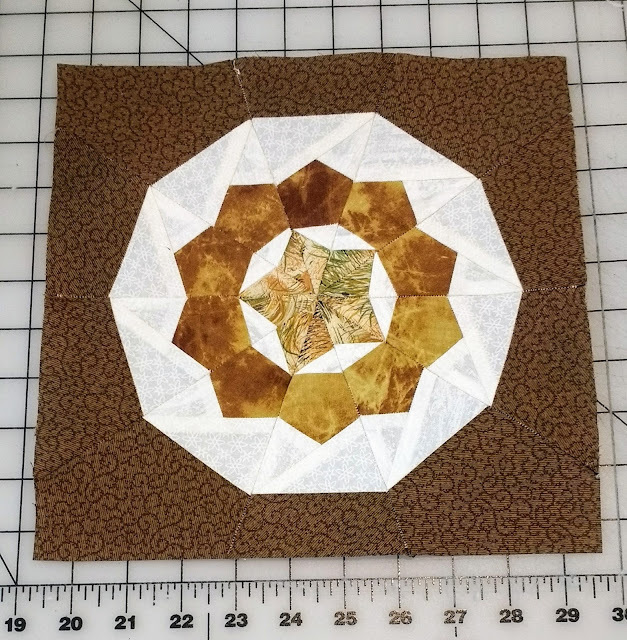 I had been meaning to pattern test this ten inch Pentadec block design of mine so I did that first using my little scraps. 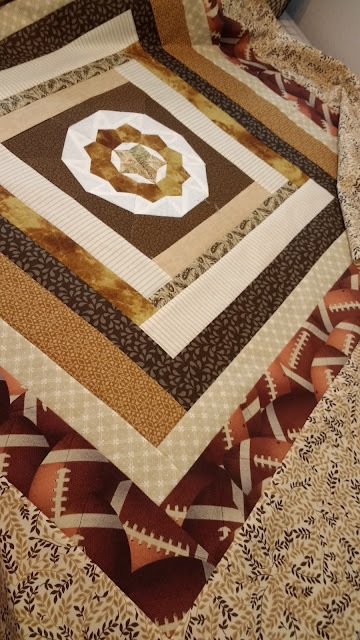 And about a fat quarter of brown. Then I used strip scraps to add some basic borders and pulled fabrics from my stash for the last two borders to make it lap sized. It'll be a charity quilt. Somebody might just love the football border! 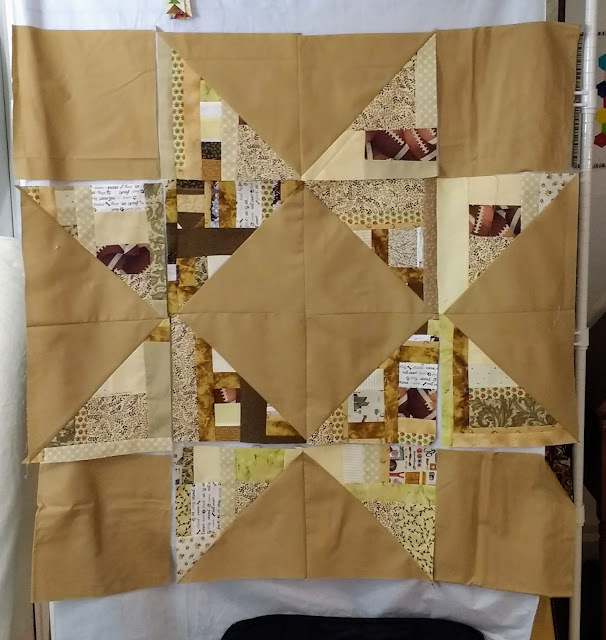 But I always like to completely empty my scrap basket for the color of the month, so I make 12" improv pieced squares with the leftovers, today I managed to make six of them to use up ALL my neutrals and browns!!! Six is of course perfect for making a star quilt! So I got all the HST blocks made and hung on my design wall they'll have to wait until the weekend to be sewn together. And I'll probably add a 1 inch brown inner border and a 3 or 5 inch (of the background fabric) border too. 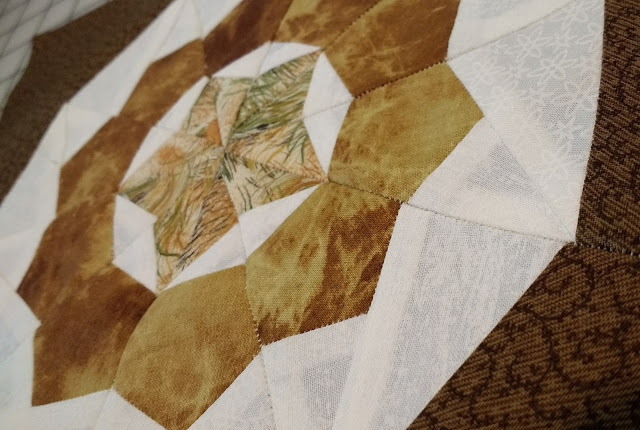 I wasn't sure if I would like this quilt top but the Kona cotton solid I'm using is just so yummy I kinda like it (no idea what color it is though). It'll probably be a gift or charity quilt.